← Friday’s Foto Fun – Guess Who’s Coming for Dinner? And Breakfast? And Lunch? Oh boy. Here’s a funny one. If your face was toasted, where would YOU be? I think I’d be in France. Good bread. Good butter. Good jam. Yep. That’s where I’d be. How about you? This entry was posted in The Scottie Chronicles and tagged dogs, food, photography, travel. Bookmark the permalink. 14 Responses to Where In The World? I am going to say you are right here at home in the good old USA! I recognize the checkered cap on the jam – it’s sold here, and that bread looks like the kind I buy – but my toast doesn’t look like that, I wish it did! Maybe Disney World? That mouse is very clever – even allowed you to be on his toast! PS Mommy says you have the cleverest mom in the world! I’d be at a dinner, receiving an award. Wrong type of “toasted”, burd brain. We’re trying to figure out what type of “award” you’d ever win. I didn’t say you’d be toasted, I said you were toast. Stop the siblings from bickering. I’d be toast if I went to the beach. We’d like to be toast in the display case so no one would eat us.They’d get furs in their teeth! Sibs, quit squabbling! Kismet is always going to have the last squawk. Stuart, wherever you are, the sustenance looks quite yum. I just received the gift 🎁 of an Elk dog treat / chew in a pet supply store we visited in Nashville. The Owner said I took my treat very gently, so she gave me the rest of it. Not exactly what you have spread out, but nice! 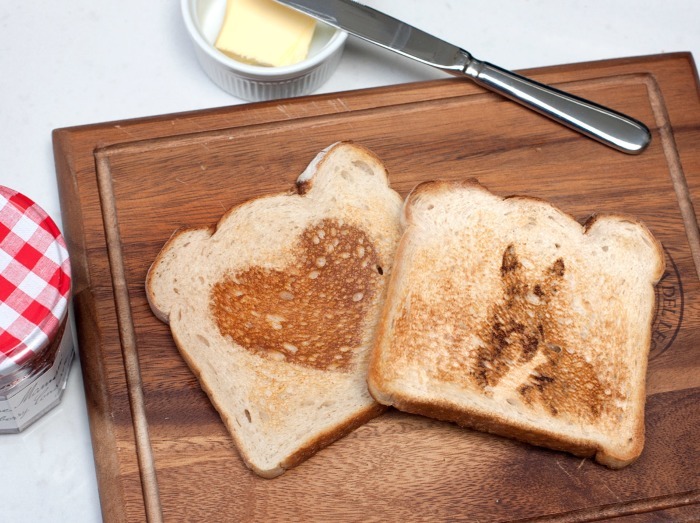 I’d probably wind up in my momma’s belly – she luvs toast. Yeah, I recognize that jar and lid, too! I have about 6 of them! The bread also from the USA! In France it would be a baguette or a croissant! So I think your momma bought a cool toaster, and I want to know where she got it! You look good toasted and in any other condition too! Dat’s what we thinks! We’d be in Florence! The food & wine is unbelievable there. Jacques would be in my lap – wherever that is.